Adding to the growing movement to rid the world of environmentally-dangerous-and-hazardous-to-ocean-life straws, Starbucks announces its plan to quit distributing single-use straws by 2020. Instead, the chain will focus on “strawless lids,” according to The Washington Post: “The coffee giant said Monday that it will replace the ubiquitous plastic straw with recyclable ‘strawless lids,’ as well as straws made from biodegradable materials, as part of a no-plastic-straws movement that has gained momentum in recent years.” Currently, Starbucks goes through 1 billion straws annually, with more than half of its revenue coming from cold drinks sipped through those seemingly ever-present green plastic straws. These strawless lids will seem familiar to anyone who’s ever had Starbucks hot coffee: They look like that white plastic lid in a clear plastic. For those of us who can’t stand swallowing ice cubes (guilty), it’s a neat bit of product design, and should help ease Starbucks’ strawless transition. 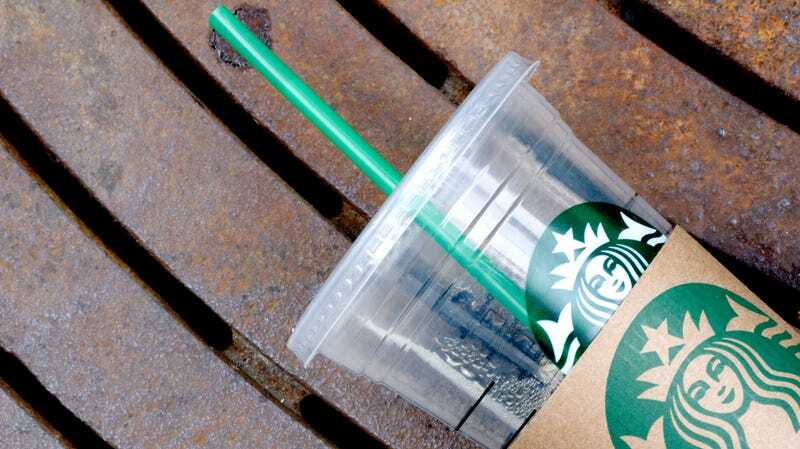 With this announcement, Starbucks joins a number of chains and institutions dedicated to phasing out single-use straws—the fifth-most common kind of trash picked up off of coastlines—like Ikea, McDonald’s, the Smithsonian Institution, Walt Disney World, and the entire city of Seattle, where Starbucks is based.